og tømmer deigen på ei fjøl. The point of the story is that the bake teaches his apprentice this song, and tells him it's easy to make pepperkaker as long as you have a good pepperkakebakesang. The apprentice then make as slight error, using a kilo of pepper and a tea spoon of suger, instead of the other way around, and much fun ensues. By the way, this isn't an actual recipe for pepperkake, at least not a very good one. Aftenposten tested this last year, (both versions) and the result wasn't very good. However, the topic for today isn't pepperkake as such, but "pepperkakehus", or ginger bread house. It is quite traditional in Norway to make a pepperkakehus before Christmas. It is constructed out of large, flat pieces of pepperkake, glued together with melted sugar, and decorated with icing, candy, and sometimes cotton wool to simulate snow. For those who interested Sintef Byggforsk (a research institute that tests building materials, and makes recommendations on best practice when constructing buildings) has a very thorough recipe, though unfortunately only in Norwegian. After Christmas, it is traditional to smash the pepperkakehus to pieces and eat it. I'm not sure if tradition dictates that this should happen on a particular day, but in general I would say that it is best to make the peppekakehus as shortly before Christmas as possible, and then eat is soon after Christmas, as leaving it out to dry and gather dust does little to improve the taste. 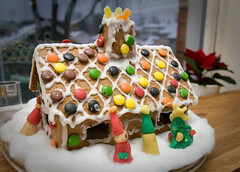 that the round candy on the top of the roof in the picture is an essential part of the decoration. Those are not smarties or m&ms, but a candy with the spectacularly Norwegian name "non-stop". The candy sticking up from the chimney are "seigmenn". They are a sort of sugar-coated jelly-people. The name ... I find I am stumpted for a good English translation for "seig". It refers to toughness in chewing, but "tough men" really does not carry the same connotation.